Used to apply organic solvents. It can be used without problems. It can be used many times, even if it is washed with thinner. (Used about 5 times repeatedly) There is no hair loss. I think that this product is enough unless there is a particular commitment. This review is about item#86934032. The stroke width was a little narrow, I wanted about 3 mm width and thickness about 5 mm already. This review is about item#86934014. It is used for painting of letters etc with urethane paint. There is not much hair loss as it can be totally compared with ordinary mountain wool. Although there is little tension and paint inclusion is few, the outlines of large letters were smooth. I think that it is suitable for finishing details and touch up in painting. 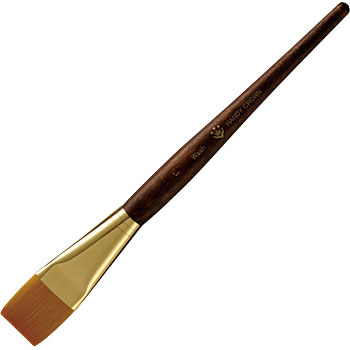 I think that it is a flat brush of good quality that can not be thought of from the price. This review is about item#86934023. I am using it when writing signs of signboards but it is very handy and useful.